Is someone you know "eggs-pecting"? Here is an adorable favor certain to spice up any baby shower! 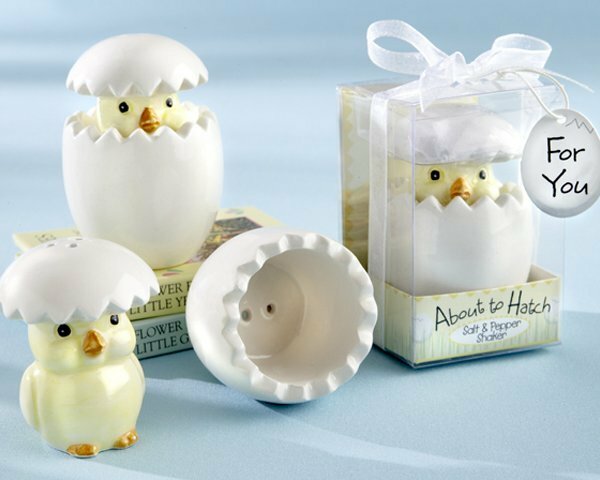 This salt and pepper set features a "cracked" ceramic egg with a chubby-cheeked baby chick wearing the top of the egg as a hat. Salt shakes from the top of the chick's hat, while pepper comes out of the bottom part of the egg. 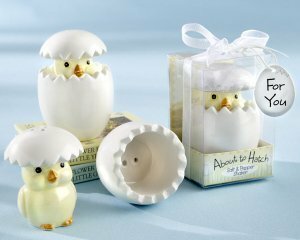 Each favor is packaged in a gift box marked with "Grade A" on the back, and "About to Hatch" on the front. We top it off with an organza bow and egg-shaped "For You" gift tag. Each shaker set measures 2 3/4" high by 1 3/4" in diameter.